Jim Curious is a man on a mission. An adventure to the heart of the sea. 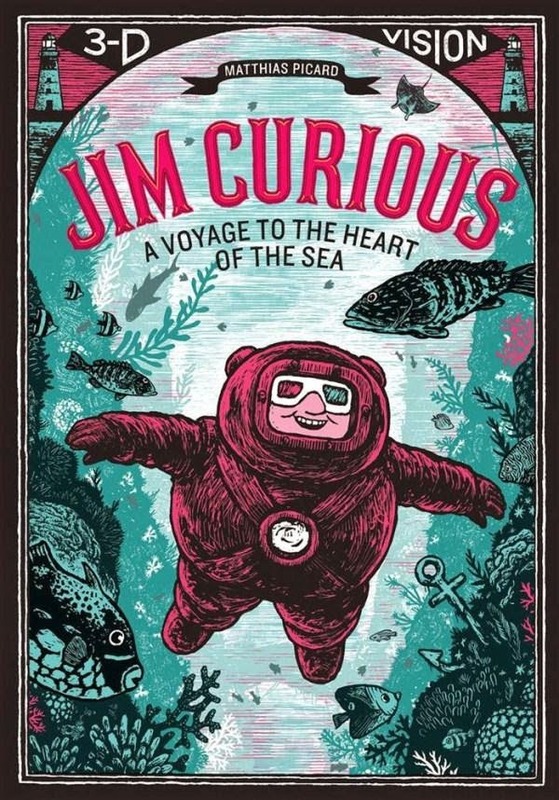 Leaving his little shack, right near the lighthouse on the edge of town, Jim dons his rotund, rubbery suit, and off he goes to the jetty, leaving his 2D life behind, climbing down the ladder and sliding into the inky water where everything becomes 3D. Donning the 3D glasses provided at the back of the book, I slipped with Jim into that inky water, too, and the stunning treasures and pleasures of an underwater wonderland magically appeared before my eyes. This is a wordless book of wonder that will utterly delight anyone from toddler to grandad. Plumbing the depths of this large format book is a 3D joy, as we follow Jim past the junk-ridden seabed below the jetty, and into the ocean proper, where fish, coral, plants, turtles and even the occasional predator awaits. A gentle plot runs through the striking imagery, hinting at metaphysical themes of earth, space and time. The ending is enormously clever and thought-provoking. A must-own for lovers of unusual, beautifully-produced, clever books, with breathtaking imagery. A must-own for kids, too.